An update on stringing the basses. 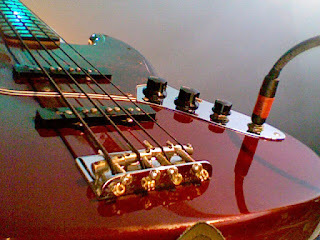 I had some round-wounds on the Fender Midnight Wine Tequila Jazz bass, which reminded me why I don't like round-wound bass strings. They eventually snap, wear out, and they sound... too bright. It's called a "bass", not a "treble". Anyway, the update to the last bass/bass string post is this: I put a set of DR "Extra Life" Black Beauties on the Tequila Jazz Bass, and I'm liking them so far. I may actually have this bass onstage as a backup behind my Lakeland "Duck" Dunn bass at The Elvis Show 2012 (YMCA Boulton Center, Bayshore NY, SOLD OUT).